The greatest danger in the life of any person is sin. But we have become so desensitized to the word that we tend to underestimate the danger it poses to us, leading us to leave it alone instead of fighting against it. We should never think that our sins will retreat quietly, lay down on their own, and die. Our sins will fight with all their might. They will become a noose around our necks trying to choke us out until we grow limp and lifeless. Sin is deadly and the only proper response to its presence in our lives is to seek its demise. 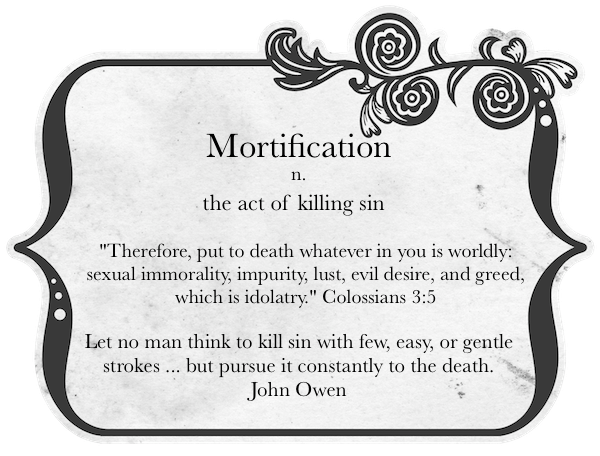 The idea of mortification is quite violent. It means to radically and thoroughly put to death the sins which exist in our lives. What is the best way to trample our sins to death? There are many helpful means to mortification, but we must start at the cross. There, in his suffering, Jesus became sin for us and was mortified in our place. This should lead us to confess our sins, seeing them for what they are: odious in the sight of God and destructive in the lives of his people. Confessing our sin is not merely acknowledging them, but hating them. Secondly we must plead with God to give us power and resolve to do whatever we need to rid ourselves of the sins we are holding onto. Those “darling” sins which we keep as pets, thinking they are relatively harmless, will quickly turn and destroy us. Third we must know the Word of God. In it we find spiritual weapons to annihilate our sins and an armour to wear in defending ourselves against all the attacks of the devil, the world and even our treasonous hearts. The hardest sins to put to death are our pet sins. The ones we enjoy, the ones we have lived with for a long time. These, especially, need to be dealt with viciously if we want to grow and mature in holiness.